Rebekah’s Barre3 fitness class has left me with tears of joy and gratitude. I always wondered why that is. After interviewing Rebekah for this episode, I think I get it. Rebekah used to be a lawyer and takes that skill of constructing an argument into the fitness studio. In each class, she advocates for self-care and self acceptance. Take a listen to hear more about Rebekah’s journey from prosecutor to fitness studio owner. 00:02 Rebecca Kaufman: Breathe big, breathe fierce, but be kind to yourself. Fierce and kind, fierce and kind. 00:12 Announcer: This is “Do Good, Be Good”, the show about helpful people and the challenges they face in trying to do good. Your host is Sharon Tewksbury-Bloom, a career do-gooder who also loves craft beer and a good hard tackle in rugby. Sharon speaks to everyday people about why they do good, and what it means to be good. 00:33 RK: Today’s practice is about slowing down. It’s about slowing down in our body, slowing down in our lives. That’s just a big practice of mine every day for ever, it seems like. So we’re gonna practice it in here and just see how it feels in your body, and see how it feels when you leave here, and maybe today you can slow down a little bit and just experience your day. So come on out, let’s do it. 01:00 Sharon Tewksbury-Bloom: I’m your host, Sharon Tewksbury-Bloom. I am so excited to share this episode with you. Today’s guest is Rebekah Kaufman. I have gotten to know Rebekah over the last year, because I have been attending her barre3 fitness studio here in Flagstaff, Arizona. If you’re not familiar with barre3, it’s basically a workout that combines moves from ballet and Pilates and yoga, and there’s just a lot of squats. Usually I warn people, if they’re going, that it’s basically doing squats for an hour. But I love it, and I really have felt like it has added so much to my life. I’m so much stronger, always feel great energy when I get out of that class. But Rebekah has not been a studio owner for very long. Before this, she was working as a lawyer in the Bay Area. In this episode we hear about why she made that dramatic shift. 01:52 RK: It’s funny, ’cause when I entered law school, I thought I was gonna be a prosecutor. I think it’s just like watching TV and you see lawyers, and I’m like, “Oh, that looks so fun, doing trials.” And I took a so different path than that. 02:22 RK: I think it’s… Doing a trial, or even an oral argument, it’s the showpiece of it. You are using your words and your body and the pauses, to really create some drama or make a point. Even though it might be a really dry legal argument, you’re still using all of that, those skills, and I loved that piece of it. It’s funny because I think I even have that in my current career. 02:52 ST: I was just gonna say, this is all making a lot more sense now. You’re very persuasive. 02:56 RK: Yeah, that performance part. So that appealed to me. I think it was when I started delving into law, talking to people who are prosecutors, I realized just that area, I think, it would just have been too emotionally taxing for me to have that part of my day-to-day dealing with really hard stuff. 03:15 RK: Even while you’re working, but I want you to find openness and ease. Focus on that instead of the work. 03:25 RK: So I was born in the late 60s, and so that was when women were just starting to have careers outside of traditional careers. And I remember my mom got me this book, and it was called something like “Girls Can Be Anything, Boys Can Be.” I don’t even know. They probably don’t have a need, hopefully, for such a book now. And I remember. So it went through all these careers like doctor or lawyer, and it ended with even the President of the United States. I remember reading that book and really thinking through, which one of these, and really feeling like, even back then, like lawyering would be something appealing. 04:18 ST: It just turns out is called “consulting”. [laughter] Which is what I do now. 04:24 RK: I know. Yeah. 04:27 RK: Maybe you just close your eyes. Open through your heart’s space, when you can stay open there, you stay energized, present. 04:46 RK: Yeah, that just wasn’t easy spending that amount of time every day, every week, every year, working that hard. Yeah, and I think it just… Over time, it just wore me down, for sure. And I know a lot of lawyers burn out, is a very common thing. So I graduated from law school in Ohio, and then my husband and I moved to California, to the Bay Area, and I started working for a large law firm. And I thought I’ll probably be here a couple of years, but it seemed like a good place to get trained. And then I ended up being at the same law firm my entire career. But towards the end, the last few years, I was doing privacy defense. 05:24 ST: And how did you feel in terms of whether the work you were doing was meaningful or was having a positive impact? 05:33 RK: Yeah. I had no qualms about that type of work. I’ve always felt like everybody needs a defense, even large companies, and a lot of times they’re sued in consumer class actions that really aren’t valid. They’re plaintiffs’ lawyer driven. I didn’t feel qualms about it. It wasn’t a direct, like being a prosecutor would have been, where there’s that direct correlation of help. But we also did a ton of pro bono. Do you know what pro bono is in the law, you’re just taking on cases either completely for free or just having your client pay your fee, like court fees. And that was a huge part of our firm. And so I did, over the years, a lot of pro bono, and I think that helped to balance out some of what I was doing. 06:27 ST: Did you have any particular case that stood out to you, where you really felt like you got personally invested in it? 06:36 RK: Yeah. [chuckle] When I was a baby associate, I started working on a case that the firm had had for five or six years, and it was on behalf of the descendants of Crazy Horse. So there were three tribes involved, and it was suing the makers of Crazy Horse Malt Liquor, which is made by the same company, or was made by the same company that made Arizona Iced Tea. So they were this company in New York, and it was over trademark infringement and others sort of… It was a really interesting case, because there really wasn’t any law that really fit the harm, which was… The name was sacred, and also Crazy Horse was really against use of alcohol, and so there wasn’t an easy way to fit this into a legal framework. And we had the case for a number of years, and finally got it settled, but it took… I think, we ended up working on it for about eight years in total, until we got to that point of resolution. 07:42 ST: I feel like that would be frustrating ’cause you’d wanna just be like, “Can we just say: You’re being a jerk”? 07:48 RK: Yeah, right. Stop doing this. 07:54 ST: And then you have to figure out what’s the legal argument there, and how do you actually go through the process. 08:00 RK: Right. To get some kind of resolution, either a win or a settlement. 08:01 RK: Breathe big, breath fierce, but be kind to yourself. Fierce and kind, fierce and kind. 08:20 RK: I think just beyond pure grit, I just think being a lawyer, sometimes you just have… It’s just pure grit. And I think the other really challenging piece of that, which you always have as a lawyer too, is helping your clients understand a settlement and the pros and cons of that. And that took a lot of work, that we visited, the partner and I, visited the three reservations and talked about the pros and cons of the settlement. It was really hard to get a number of people on board. 08:57 ST: Yeah, you really had to build consensus on that. 09:00 RK: Yeah, and it’s hard when you’re dealing with more than a handful of people. 09:05 RK: Can you breathe through the discomfort you’re creating, finding ease, calm in the effort. Four, three, on two, last one. You’re gonna plank at the floor or at the barre. You choose where you are going to feel powerful and strong today. Push the floor or barre away. 10:40 RK: There is power in slowness, there is mindfulness in your breath, in the moves. When your mind you can bring to your muscles, you get deeper, you change. 11:04 RK: My last day working was at June 30th, as a lawyer. And then we moved, and then my studio opened in April of the following year. So a really long, long process. And I think probably the first four to five months after we opened, it was pure survival, just figuring things out, and supplies and air conditioning, just all these little things that go on behind the scenes in running a business. And I was teaching a lot, and, well, I was trying to get more instructors and get them trained. So I think it was probably the end of that summer, last summer, where I really thought it started to feel like, “Okay, this is the life I wanted, and I’m present for it. I’m not just still in that go-go-go survival mode. I’m really enjoying my days and they feel balanced, and I can pick my kids up every day from school and we have dinner at night.” All those things that I’d hoped to have, finally I had, after about a year. 12:17 RK: Yeah, yeah. I think I didn’t realize how much work goes into running a studio, running a business, beyond just the teaching a class and having interactions and keeping it going when the studio’s open. There’s just so much else that goes on when we’re closed, me and my computer. 12:43 RK: Lift, lift, lift. Now are the moments to ask yourself where your thoughts come right back into your body, if you’ve left. 12, 11, 10. Four, three, two, pause. 13:08 ST: I hope you’re enjoying Rebekah’s story. To support this show, please consider buying a shirt o a sweatshirt. One of the styles you can buy is a tank top for your workout. I’ll definitely be wearing mine at one of my next barre workouts. You can find the details at our website, dogoodbegoodshow.com, or at the Facebook page, facebook.com/dogoodbegoodshow. Also, if you can please rate and review our show in the podcast app that you’re using, that would be incredibly helpful to get other people to be able to find the show. Thank you so much for your help. Now back to our conversation. 13:48 RK: Today’s practice is about slowing down. It’s about slowing down in our bodies, slowing down in our lives. That’s just a big practice of mine every day for forever, it seems like. So we’re gonna practice it in here and just see how it feels in your body and see how it feels when you leave here, and maybe today you can slow down a little bit and just experience your day. So come on out, let’s do it. 14:15 RK: The best part of it is the client connections, and seeing what a difference it makes in people’s lives, that it’s not just people are going in and, “Wow, I got this great work out.” But they really leave and people are telling me, “I haven’t been able to do this or I haven’t been pain-free since I started doing this.” The stories are different, but seeing how honest people are, and how life-changing it can be, that I knew would happen, but it’s amazing every time I hear one of those stories. 14:48 RK: Follow and flow with your breath. Feel how expansive you are in these moments, full of possibility, full of strength, free of worry and fear. 16:42 RK: I am so honored to hear you say that, because that is really, for me, what it is about and why I’m doing it. I didn’t want it just to be a fitness studio. That’s not in this next phase in my life. That wasn’t what this was about, is just helping people work out. That’s obviously a piece of it, but really helping people, and primarily women, just feel good in their skin. But another piece of it too is, I think there’s something so special when you’re in that room, and you’re struggling. Because you will struggle in your body, because every time you’re getting deep in your muscles, and in that moment where you realize, I can just breathe through that I can do that. 17:31 RK: I feel like that’s really where it’s life-changing, because you leave that and hopefully people are remembering, “I can breathe through this, I got through that, I can breathe through anything.” Because life is life, and good things are going to happen and really crappy things are going to happen, and being present and being able to just weather it with grace. To me, that’s what the class is about. That’s really, for me, what it’s about. And so, yeah, you’re right, it is, for me like an argument, and starting it really from the beginning, and just when it feels appropriate, just dropping that adding it to the class. And I never know how people will receive it. I never know if it’s making any sense on that given day, but that’s always the messaging I’m trying to give, which is just breathe through where you are and accept where you are. 18:32 RK: We all have moments in our day and in our lives where we feel uncertain, distracted. But your practice here is just to open and feel fearless. Notice how you can carry it through in the rest of your day, the rest of your life. Breath big. 19:00 RK: Teaching, especially teaching barre3 in the way that I’ve described, it’s very vulnerable, and you have to be, as soon as you turn that mic on and introduce yourself, you have to be present and really powerful, in a place that you can hold space for everybody in that room and guide them through a workout, but guide them through something more. And some days, yeah, some days it’s hard because you’re dealing with your own whatever’s come up for you that day. And sometimes it’s a lot harder than others. So yeah, we talk about that, but also letting go of perfection. As instructors, just like we ask of our clients, just let go of perfection and do the best you can on any given day. 19:47 RK: I think one of the things I’m most proud of is the age difference in our studio. There’s a woman who comes up, and she’s come up the last two summers. She’s in her 80s, she’s a poet, she’s really amazing. And when I see her come in, and she just does what she can do, it’s just so amazing and so powerful. That’s where I feel like this is, like we’re on to something here, when you can have women of all ages in a room together, supporting each other, and just each of us doing exactly what we can do. I think the other piece I would just add is; just being more courageous in life. I think that’s a lesson I wish I had known much earlier. And I chose the path I chose for a number of reasons and it made me happy for a number of years, but I think having the courage, at certain points, to say, “This is no longer working and I’m gonna follow my heart’s desire,” because life, it’s so short, it goes so fast, so fast. 21:02 RK: Last one. Slowly bring your hands by your side, bend your knees, feet are planted on the floor, and you’re just going to windshield wiper your knees slowly, side to side, bringing movement back into your spine. And come back to center, rock forward. Or push yourself up to a low crouch. Take a moment to pause here, reconnecting with your breath, and your body. 21:53 RK: I feel like if I wake up every morning and I ask myself, “How do I wanna be, how do I wanna present myself? What impact do I wanna have this day.” It’s not just how I feel, but how am I going to make everyone else feel around me, or at least help them. And so for me, being good, doing good is those days where I really have succeeded in that. I’m not closed in, it isn’t about me, but I’ve really been able to open up, and just be present and supportive for other people and hopefully improve their day in some way. And I just take it day-by-day, day-by-day, person-to-person. 22:36 RK: Breathe in slowly, into your heart, into your chest. Let it out and then open your eyes. Have an amazing day, guys thinking so much for coming today. Hope you feel great all day. 23:03 ST: Thank you for listening to “Do Good, Be Good”. For show notes on all of our episodes, visit dogoodbegoodshow.com. And if you want more behind the scenes stories and insights, check out our Facebook page, facebook.com/dogoodbegoodshow. Thank you to Rebekah Kaufman, for coming into the studio and sharing her story. Next week we will have a special bonus episode, where we will be hearing a conversation between my cousin, Dan Bloom, and his best friend David Ross, about meaningful work. 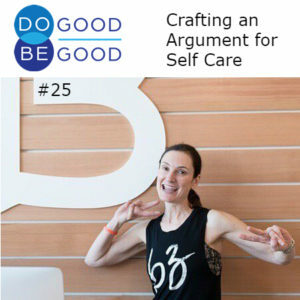 To subscribe to the podcast so you can get each episode as soon as it is released, just search for “do good, be good” in your podcast Apple choice, whether that’s Apple Podcast, Stitcher, or Google Music. Any of them should have it. If you don’t find it, please email me at connect@sharonspeaks.com. And thanks as always to our host, Sun Sounds of Arizona. Music in this episode is “Bathed in Fine Dust” by Andy G. Cohen, released under a Creative Commons attribution international license, and discovered in the free music archive. Until next week, this is Sharon Tewksbury-Bloom, signing off.